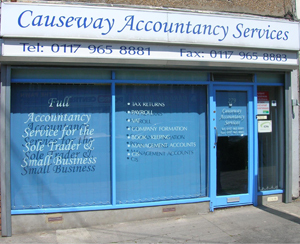 Causeway Accountancy Services are a family run firm located on Lodge Causeway in Fishponds. We have been based here since 2005 and have a combined experience of over 50 years in all forms of accountancy, book keeping and tax affairs, for Sole Traders, Partnerships, Registered Charities and Limited Companies. We have an approved practising licence with the AAT in Book keeping, management accounting, payroll and VAT, as well as being ICPA Accepted Accountants. We also have over 20 years of experience with Sage Accounts and payroll software as well as being a Sage approved reseller and member of the Sage Accountants Club. If you wish to enquire as to any of our services then please contact us through the Contact Us page and we will get back to you.